Men's lightweight button down work shirt. Appearance counts. From the front office to the job site and back, this chambray work shirt keeps you looking good on the job. It's prewashed for softness, and the lightweight cotton fabric offers breathable comfort. Arm pleats give you room to reach and move whether you're climbing a ladder or hauling supplies. Great fitting and great looking shirt! Attractive, lighter-weight chambray. Good for around town and on warmer days. You'll either need to iron it and accept the wrinkles. Comfortable. They fit well - stay tucked in and look great with jeans. I would recommend this shirt. I am very happy with the shirts . The quality is great as I always expect from the Carhartt name. My husband absolutely loves the comfortable material and the great fit. Gives him the extra length he needs from a shirt. And they look good too. A durable workshirt in a light and breathable cotton chambray - just what I need during the warm months of the year. Perhaps not as durable as other work shirts, but that trade-off is expected for its non-heavy qualities. Great for to wear on warmer spring days outside and still nice enough for a night out. Comfortable material with a great fit. One of the most comfortable shirts I've ever worn. Good wearing shirt. No complaints about the shirt.Long Sleeve Chambray Shirt? I use these as overshirts. It takes the chill off a cool evening. I own three different colors. I'm buying a tan one today. Excellent work shirt. Even wore to Church with a tie. After a hard day’s work launders well & comes out of the dryer on to a hanger. None to minimal touch-up iron. love it ! Exceeded my expectations !...please don't discontinue these like you have done with other great products. I was expecting a work shirt, and the shirt is just too thin. We appreciate your input. Please contact us at 1 800 833 3118 if you need any assistance. Kinda itchy...was hoping for a softer material. Thank you for your feedback. Please contact us at 1 800 833 3118 with any questions. Excellent. Almost too good to go to work in! It looks and wears great. Made of good quality. Very nice I like carhartt products and I am usually always pleased! Very nice and comfortable shirt. Well made but not too bulky for work. I bought this shirt to wear with jeans, wear at a social event or to work around the house. The color is perfect and so is the fit. Great shirt. Second one we bought. This is one of Carhartt's great work shirts. Looks great after every wash. Comfortable and true to size for Carhartt. Would definitely purchase this shirt again. Highly recommend it! Comfortable fabric, soft but rugged. Sized just right based on typical demensions. I got the tan color and I really like the shirt overall. Great shirts, I have one in every color. Not quite what I had expected, but a good shirt, fits my husband well, and will be more appropriate in warmer weather. Too soon to judge durability. I was looking for a CHAMOIS shirt at the time, but you no longer sell them. Well guys, if you are looking for a high quality shirt with rugged sexyness sewn in, look no further. Great shape, great fit, great shirt. Buy it! Looks good and hopefully it will wear well. Looks good but hasn’t been worn yet.Why are there not more options of color and styles. The men on the building shows on TV have some options that don’t seem to be available to buy? 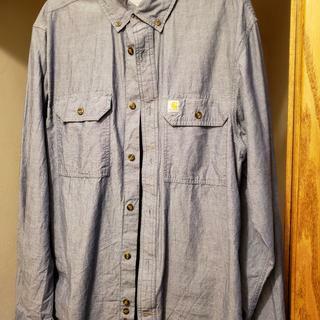 Great old quality chambray shirt. This is a great shirt. Not to warm and wears great. Holds up very well. Great shirts! Fit great and look great. Would be nice to see an athletic fit series of shirts! The shirt is very comfortable even if a bit oversized, it looks good (just have to keep tucking it in, but that's normal), and doesn't require ironing if you hang it up fresh out of the dryer. The only down side is the same as I have with most shirts--even shirts I like a lot and wear regularly--the waist is tent-like for me. I just need to see how much it costs to have shirts tailored I guess. I am trying to give 5 stars although it doesn't look that way on my computer. My husband farms and these are his favorite shirts for the warm/hot seasons. I am so glad Carhartt resumed making them in size small. I have bought 12 this year. Thank you for that. Would definitely recommend them. I am an Engineering Manager and switched over to these shirts from another brand at the request of my guys. Thus far they seem to really like the quality and fit of the shirts. The main complaint with our previous shirts was durability. I don't feel like I have a good handle on how these shirts will hold up (therefore the lower rating) After a couple months in the field I will try to update the status. The shirt is comfortable and durable. However, the yarn used to keep the buttons in place can unravel fairly quick, especially the pocket buttons. Thank you for your input. Please contact us at 1 800 833 3118 if we can further assist you. Very good! The sleeves are long enough and the body of the shirt doesn’t look or fit like a tent. I usually have to get my shirts made for three times the cost. Thank you, I will purchase more! Great fit and fabric weight! BEST ANSWER: Yes, it does typically require ironing if laundered with other clothes. If done in a small load, probably not for most people, but I prefer a call islet look. Either way, it feels great and stays looking good all day. It’s a “go to” shirt for me when I want to feel comfortable and look good at the same time. I wouldn’t worry too much about the ironing. It’s a snap to iron anyway. Hope this helps! Yes. The fabric is quite thin----not like former Carhartt chambray shirts. It does not launder as well as former shirts, so get out that iron if you want a nicely-pressed look! Yes it will be wrinkled. But for your use and this fabric that might be ok or even a positive. Not really—I never do and it looks okay. Now, if you’re a bit OCD about then maybe. It fit just fine compared to my other shirts. If anything it might fit a little big, but defiantly not a little small. I purchased shirt for my nephew. The shirt is great quality,fits to size and either dress up or a work shirt. I have a hard time finding shirts that fit. I’m a Medium-Large and the Medium fits me perfectly. It runs a little on the small side. Is the black really black or more of a dark grey? The picture looks lighter then black. BEST ANSWER: Could be called either one. Not a jet black. I would describe it as “grey to the black side” or “ black to the grey side”. I was pleased with it! It’s a bit lighter, but good looking. You see the fibers because it’s heavier weight than a regular shirt. Husband likes these a lot. It is more like a dark grey than black. BEST ANSWER: It is currently made in India, Bangladesh, or Nicaragua. There needs to be a continue shopping app, where is it? BEST ANSWER: Once you add an item to the cart, you will see a button to continue shopping. Please contact us at 1 800 833 3118 if we can further assist in any way. When will carhartt start making medium-tall shirts? I'm swimming in larges but after I wash a medium I end up with a shirt with sleeves that hit above my wrist. BEST ANSWER: We'll be glad to share your feedback with Product Design. Please contact us at 1 800 833 3118 if you are having any concerns with your garments. Is this the long sleeve version of the S200 (short sleeve)? BEST ANSWER: Yes - both are made of a 4.8 ounce chambray with two chest pockets and a button-down collar. are they cut the same? Yes, both styles will be cut the same, with the same fit. What is the length and width of a size Medium? I am 6'2.5", 160 lbs and it's hard to find shirts long enough that aren't huge around my waist. BEST ANSWER: To give you an idea of the width, the bottom of this shirt in Medium measures about 44.75 inches and the center back length (from the center back collar to the bottom of the shirt) measures 31 inches. We recommend selecting a size based on your chest and waist measurements by using our Size and Fit Guide. You are welcome to contact us if we can be of further assistance. Bought three large size shirts all shrunk after washing several times. To small for me, is shrinking a problem? BEST ANSWER: Our garments should not shrink more than 2-4% over the life of the garment. We are sorry to hear of this issue and will share the comments with Quality Control. Could this be offered in Navy and Dark Brown also please? BEST ANSWER: We have shared your feedback with Product Design. Imported from where? China? France? Canada? Vietnam? Mexico? I do North America imports. BEST ANSWER: The S202 is made in India.